This profile is the first in a series – aimed at promoting the valuable work of our members. 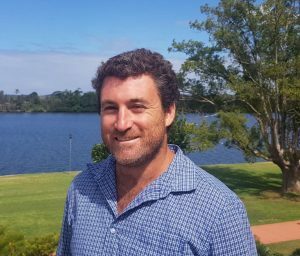 PIANC Member Dave Hopper is a very busy man – not just in his role as NSW Environmental Officer for the NSW Department of Industry in Newcastle, but also with his active involvement in two Working Groups for PIANC’s Environmental Commission. Dave was in Brussels earlier in the year for back to back meetings of two Working Groups. WG195 Applying Ecosystems Services for Waterborne Transport Infrastructure has members from Germany, The Netherlands, UK, USA, Belgium, and Australia. Hopper reports that the introduction to Applying Ecosystems Services has made for much in depth discussion. Several very interesting case studies have been proposed for demonstrating the application of Ecosystems Services. These include Australia’s breakwater upgrade at Coffs Harbour, Seattle’s Blue Carbon pilot project – enhancing blue carbon in ocean and nearshore environments, West African port expansion at Tema, Ghana, construction of an inland waterway for international navigation in Nicaragua, beneficial use of dredged material in the Netherlands and USA, river restoration plans for the Eems estuary and a port extension in The Netherlands. The meeting helped to complete the group’s most challenging chapter and momentum has been regained for the final chapters. WG214 Beneficial Sediment Use has just begun its journey. The first meeting was attended by 18 nominated members and included delegates from Australia, Belgium, Germany, Japan, The Netherlands, UK and the USA. The day Dave arrived in Brussels, 70,000 people took part in the “Rise for Climate” march to pressure the Belgian government and the European Union to increase their efforts to fight climate change. Dave shares their concern and sense of urgency; perhaps that’s why he’s so busy.